Are You Guilty of Being an Annoying Driver? Bad parking, tailgating, not using the indicators… These driving habits are considered bad form and can cause an eruption of road rage in even the calmest driver. Yes, you may decide to take the high road when another driver annoys you, but are you guilty of being a little bit hypocritical and doing them yourself? 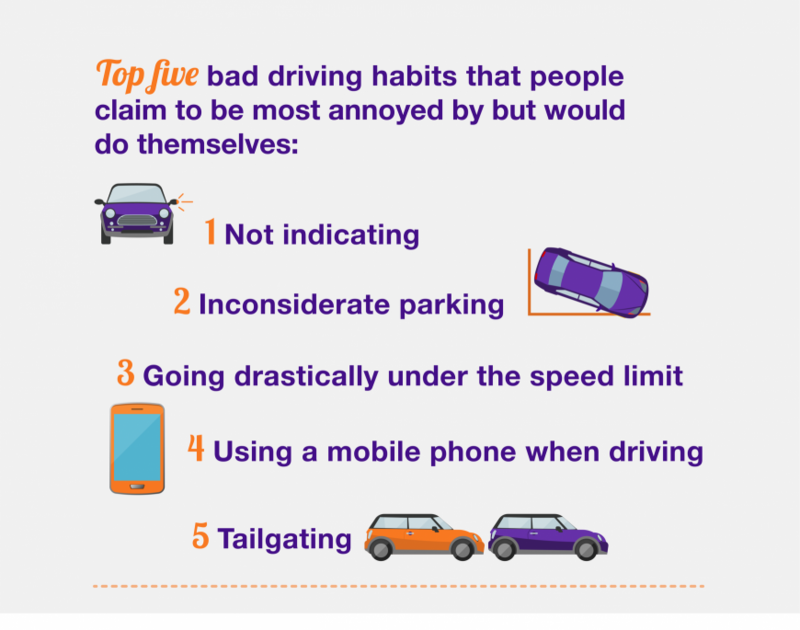 Here at Imperial Car Supermarkets, we were intrigued to find out which driving habits annoyed people the most and how many admitted to still doing it themselves… Hey, no judgement – none of us are perfect! To find out how many UK and Republic of Ireland drivers were guilty of bad driving habits, we asked them a few questions about their pet hates on the road and how often they admit to doing these things themselves. We also asked them about the bad driving habits they would be most likely to advise their children against doing. Other habits that made our list of driving annoyances included speeding, leaving on full beam headlights and not letting others through when it’s their right of way. Overall, 35% of people we asked were exemplary drivers and said that they had no bad habits at all when driving. However, 26% of people admitted to engaging in bad driving habits at least once a month and 20% said once a week! Where Are the Most Hypocritical Drivers in the UK and Republic of Ireland? 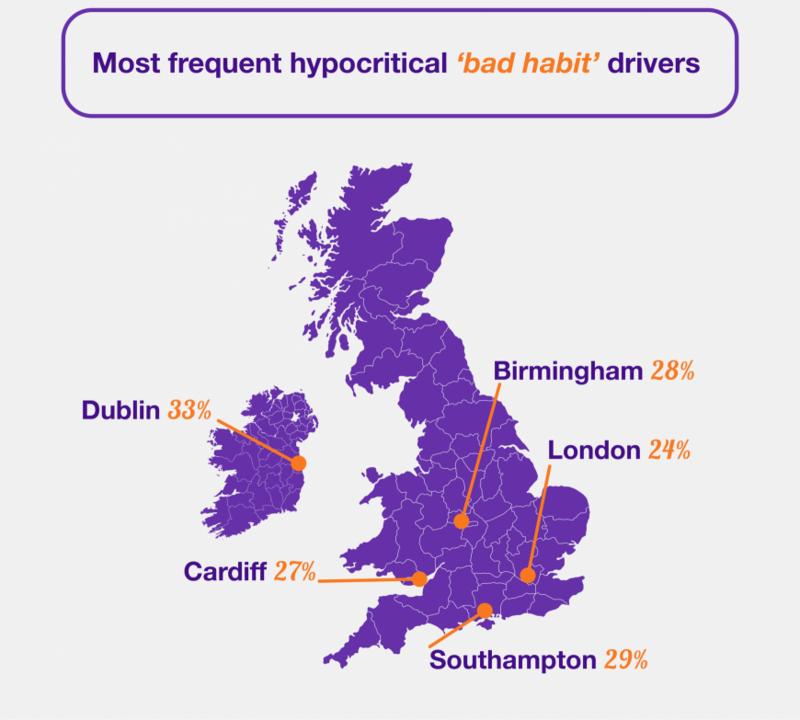 Our survey revealed that the most frequent ‘bad habit’ drivers, who were guilty of doing something annoying on the road at least once a week, were located in Dublin (33%), Southampton (29%), Birmingham (28%), Cardiff (27%) and London (24%). In fact, 42% of drivers in Dublin admitted to using their phone whilst driving, with just under half of these doing it at least once a week… We recommend avoiding driving in these UK cities if you’re easily annoyed in the car! In terms of gender, men seemed to be worse for bad driving habits. 26% admitted to not indicating compared to just 18% of women. Also, a quarter of the males we asked admitted to parking their cars inconsiderately. · 29% of 18 to 24-year-olds admitted to bad driving habits once a week, compared to just 10% of those in the 65+ category. · 36% of 18-34-year-olds said that inconsiderate parking was the habit that annoyed them the most, yet still admitted to doing it themselves. · 30% of 65+ said that not letting others through when it’s their right of way was their pet hate, despite still doing it themselves on occasion. · 44% of parents said they’d strongly advise their children against using a mobile phone while driving, despite a fifth of them doing it themselves. · The biggest priority for 65+ was tailgating, with 55% advising their children against this bad habit, compared to just 14% of 25-34-year-olds. · 51% of those in the 65+ category warned their children against not letting drivers through when it’s their right of way, whilst this was a concern for just 7% of 25-34-year-olds. · The priority for 18-24-year-olds was leaving their full beam on, with 36% of our respondents in this age category concerned about this. Other dangerous habits that concerned parents would warn their children against included not wearing a seat belt, driving under the influence of drugs or alcohol and driving when tired or with the flu. Are We a Nation of Hypocritical Drivers? The results from our ‘Hypocritical Driver’ survey was incredibly revealing. 65% of drivers admitting to bad driving habits, with 20% of these doing it at least once a month! Drivers in Dublin were shown to be the most hypocritical, with 42% using their phones whilst driving. This was a concern that many parents advised their children against, despite doing it themselves. Also, it looked as though the people in the 65+ age category were the most considerate drivers. All in all, it seems as though many of us are hypocritical drivers in the UK. If you’re prone to a bit of road rage, take your good example from the 65+’s that we asked and remember to be more considerate when driving. Also, make sure you warn your children against all these bad habits so you can enjoy a more relaxing drive in future!